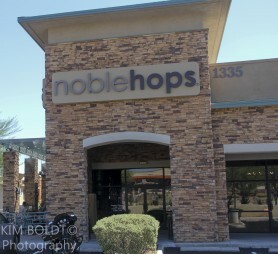 Noble Hops is definitely Tucson’s original restaurant serving a variety of high end craft beer and food. The menu at Noble Hops is constantly changing with new craft beers and fine fare. Noble Hops is locally owned and operated by Aric and Josh Mussman. These native Tucson brothers combined their love of hand-crafted food and beer into the Noble Hops restaurant in Oro Valley AZ. The name Noble Hops was coined to reflect the key ingredient in outstanding craft beers. Hops are the heart and soul of beer. The name Noble Hops is a gesture to an ancient group of respected European hops that are historically low in bitterness and high in aroma. Noble Hops offers a seasonal menu of high-quality, delectable food. The menu consists of daily specials, soups and salads, small plates, burgers and hearty entrees. Oh, and homemade desserts to die for. An excellent selection of over 150 beers from around the world is available. At least 28 are on tap on any day. Noble Hops also features kegs of house wine, bottles of fine wine, and of course a full bar. The patio seating area provides stunning views of Pusch Ridge and the Catalina Mountains. This spacious patio is over 700 sq ft and is comfy year-around with misters, a huge gas fire pit and built-in heaters. A centerpiece of Noble Hops is the distinctive 30-foot-long indoor/outdoor bar. Should the clouds bring a little rain these is also indoor seating at the bar and cozy lounge. A dining room just off the entrance is available for additional indoor dining or private parties. A large chalkboard wall is regularly changed with daily food and craft beer specials. Craft beer, excellent fare, terrific service and spectacular views. Noble Hops is the perfect spot for lunch or dinner. Happy hour runs from 2 to 6 PM. There is also a reverse happy hour that runs from 10 PM to closing Sunday thru Thursday. Happy Hour 2 P.M. – 6 P.M.
Moving to the Tucson AZ area or considering a future home in Southern Arizona? We can help.